Why do some people insist on tanning? Everyone knows, or should know, that exposure to UV radiation — from the sun or artificial sources such as sunlamps in tanning beds — increases the risk of developing skin cancer, according to the National Cancer Institute (NCI). People who say they’re addicted to tanning act like alcoholics and drug addicts. Researchers at the University of Minnesota, in Minneapolis, report the risk. That’s the latest recommendation from the American Academy of Dermatology (AAD). The American Academy of Dermatology and the American Medical Association have called for a ban on the sale and use of tanning equipment for nonmedical purposes. 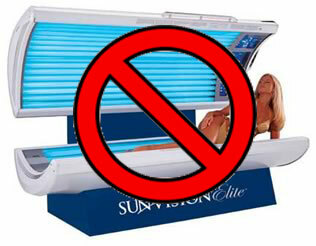 And the FDA and Centers for Disease Control encourage people to avoid the use of tanning beds and sun lamps. The tanning industry say that dermatologists have a “political agenda,” and that indoor tanning is actually good for you.